The smartwatch is pre-integrated with Tata Communication's MOVE IoT Connect SIM, which gives a childs' parents diverse information such as location, messaging, video and voice calling option, which are end-to-end encrypted over a VPN. Tata Communications and Omate have partnered up to develop the new Omate x Nanoblock smartpwatch for children, which will be demoed at MWC 2018. It comes pre-integrated with Tata Communication's MOVE IoT Connect SIM which gives a childs' parents diverse information such as location, messaging, video and voice calling option, which are end-to-end encrypted over a VPN. The company says that the Omate x Nanoblock delivers "reliable, high-quality network connectivity in more than 600 mobile network operators (MNO) around the world ." The smartwatch will be up for pre-order in April from Omates' website and will start shipping in June 2018, exclusively in the US and Europe. 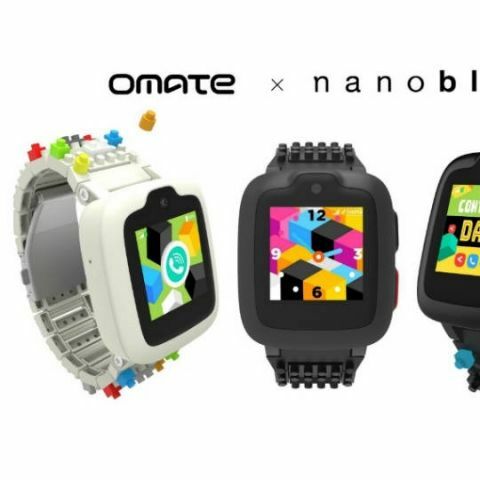 Tata Communications, a leading digital infrastructure provider, and wearables maker Omate are working together to equip the new Omate x Nanoblock children’s smartwatch with instant, secure, global connectivity straight out of the box. With a Tata Communications MOVE - IoT Connect SIM built in, the Omate x Nanoblock will pave the way towards a new frontier of digital parenting. There will be a demo of Omate x Nanoblock at Mobile World Congress in Barcelona: Tata Communications’ booth - Hall 2 H30. Smartwatches such as the Omate x Nanoblock help parents stay connected with their children and know exactly where they are when needed – providing invaluable peace of mind. This peace of mind is now reinforced in the Omate x Nanoblock because Tata Communications MOVE - IoT Connect carries all location, messaging and video calling data over an end-to-end encrypted virtual private network (VPN), ensuring maximum security. Tata Communications MOVE – IoT Connect harnesses Tata Communications’ relationships with more than 600 mobile network operators (MNO) around the world to bring the Omate x Nanoblock reliable, high-quality network connectivity anywhere in the world. These relationships also help accelerate Omate’s international expansion outside its home market in China, allowing the company to sell the smartwatch to retailers and other partners as a ‘wearable-as-a-service’, eliminating the need for separate data connectivity agreements with different local MNOs in each country. The API-enabled, automated Tata Communications MOVE – IoT Connect platform is fully integrated with Omate’s business processes, giving the company real-time visibility over customers’ data usage patterns, and control over tariffs and billing. This means that when a new customer switches on the smartwatch for the first time, it is instantly connected. The software-defined capabilities of Tata Communications MOVE – IoT Connect also make it easy for Omate to customise features and content with children’s needs in mind. Tata Communications MOVE is part of the company’s aim of creating truly global, borderless mobile experiences for people and things. It is underpinned by Tata Communications’ partnerships in the world’s mobile ecosystem and its global network, which today connects 4 out of 5 mobile subscribers and carries over 25% of the world’s Internet routes.